Dorm decorating should be fun, first and foremost. To make it so, you'll need the right college decorations. 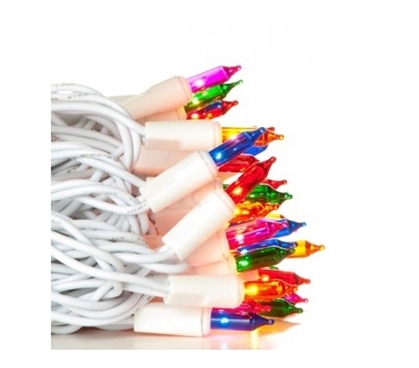 So move over regular, cheap posters and add some vibrant college wall decor items like these Mini Dorm Lights - Multi-Color - White Wire. These college lights make for ideal dorm wall decor items since they light up and have no shortage of color! No matter what look you're going for, a string of multi-colored lights can add only more color and fun to your dorm decorations. Since they're cheap dorm item, you can buy a few sets and string them together. If you're really feeling ambitious with those dorm decorating ideas, wrap these string lights around your dorm furniture, your window frame or on any of your college supplies that are in need of a boost of color. Aside from making dorm decor look better, these lights for college students are also great for creating a needed night-light or just adding some extra lighting for studying at night. They're useful and fun dorm accessories, for sure.